With Bayern and Dortmund’s demolitions of their respective opponents in the Champions League semi-finals this week, the interest in the Bundesliga – and the holding it up as the image of all that is holy in the world of football – has never been greater. While Bayern are a side everyone knows about, a genuine superpower, it is Dortmund who have really caught the eye, for everything from their intense pressing style of play, to the Yellow Wall of fans, and, of course, the charismatic manager Jurgen Klopp: a mixture of a young Jose Mourinho and a less-insane Marco Bielsa. Of course, the league is to be admired for many reasons outside of Dortmund: beer, ticket prices, beer, fan ownership, safe standing and beer to name a few. Yes, the fan who yells ‘give me a B’ at a Monchengladbach game may be the most unpopular in football, but don’t let that put you off. The Foals seemed destined for 2.Bundesliga in February 2011, until Lucien Favre arrived like a Swiss Knight to not only escape the drop, but then turn them into unlikely Champions League qualifiers and put Marco Reus on the brink of superstardom. 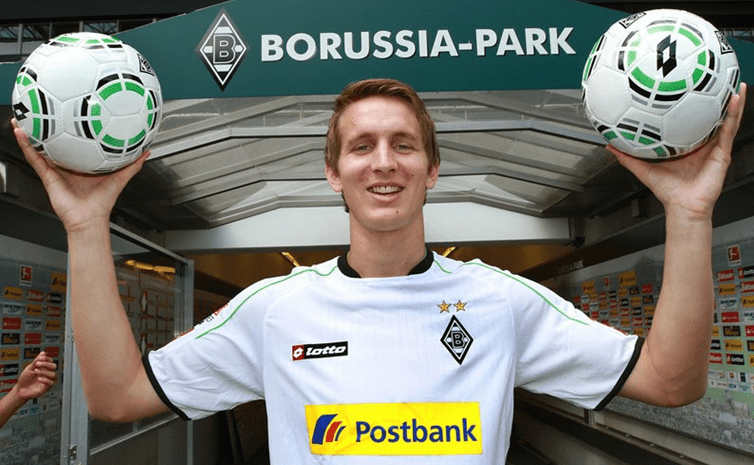 They had their best players poached by the top clubs – Reus went to Dortmund; Dante to Bayern – but reinvested the money wisely in the likes of Luuk De Jong and Granit Xhaka. Coupled with the likes of Marc-Andre ter Stegen and Patrick Herrmann, they have a team full of youth and promise, while Favre’s preference for swift, attacking play makes them fun to watch. While a repeat of Champions League qualification may be beyond them this season, they’re in with a chance of the Europa League, and certainly look like they could establish themselves as perennial European contenders for years to come. For an easy/lazy comparison, you could say Freiburg are this season’s Monchengladbach: they were floundering in the relegation zone, looking certain to go down, when they made a managerial change and turned things around, and have had unprecedented success this season. Christian Streich was the man tasked with keeping Freiburg up back in December 2011, and he did that and then some, a 10-game unbeaten streak leading the club to a 12th place finish, and all after selling their top scorer Papiss Cisse in January. This season, one in which many predicted further relegation struggles, they have defied all odds and currently sit fifth. Streich himself has earned many admirers, fans and journalists alike, as much for his press conferences and passionate touchline behaviour as his football. This was particular represented in a local newspaper, who ran a ‘Streich of the week’ feature, and announced the overall winner at the end of the season: “where is the mustard?” If that doesn’t sway you, nothing will. Only four clubs have scored more goals than Bremen (45) this season, and 75% of them will be playing Champions League football next season (the other is Hannover). However, their free-scoring ways come with a caveat: they concede them just as easily. In fact, they’ve conceded even more, with their 59 goals shipped the joint-worst in the league. They’re as entertaining as they are bewildering: it was just back in 2009 that they won the DFB-Pokal, and finished runners-up in the Uefa Cup. They currently sit 14th. In recent years, they’ve seen a wave of top talent depart the club: Marko Marin and Claudio Pizzaro both left that season; in 2010, Mesut Ozil moved to Madrid. Head coach Thomas Schaaf is the ultimate one-club man: he came through the youth ranks, spent his entire playing career at the club, and has managed them since 1999, after first coaching the youth teams while still a player. They may not be anywhere near past glories – such as the league title winning side of 2004 – but, from an outside perspective at least, they’re certainly value for money. These are just suggestions, of course. If you want to choose your own, follow this handy (if now slightly dated) flowchart. Sports Journalism student, Sunderland fan, write about German football at www.dasbootblog.wordpress.com, Premier League/Sunderland at safc.com, A Love Supreme etc.